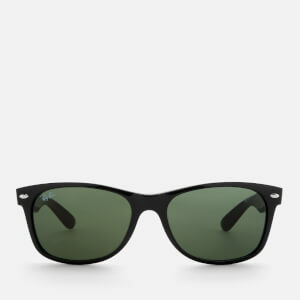 The classic Original Wayfarer Sunglasses from Ray-Ban are the most recognisable style in the history of sunglasses. Made with lightweight acetate, square frames for strength and flexibility. The green classic G-15 lenses are durable RB2140 and are characterised by blocking out most of the blue light and providing remarkable colour contrast for clarity of vision. Constructed with a hypoallergenic silicone nose pad for comfort, the unisex sunglasses feel as good as they look. Finished with the brand's iconic rivets and the metal signature monogram to the lens and sculpted temples. E.N. Frame: Acetate. Lens: RB2140 Green Classic G-15. Eye Width: 50mm. Bridge Width: 22mm. Temple Length: 150mm.